NeoCon 2018 is in full swing in Chicago, and so is Knoll. This year, the Knoll showroom presented Hospitality at Work, illustrating the power of bringing together the Knoll constellation of design-driven brands within an Immersive workspace planning solution for commercial, healthcare and education spaces. 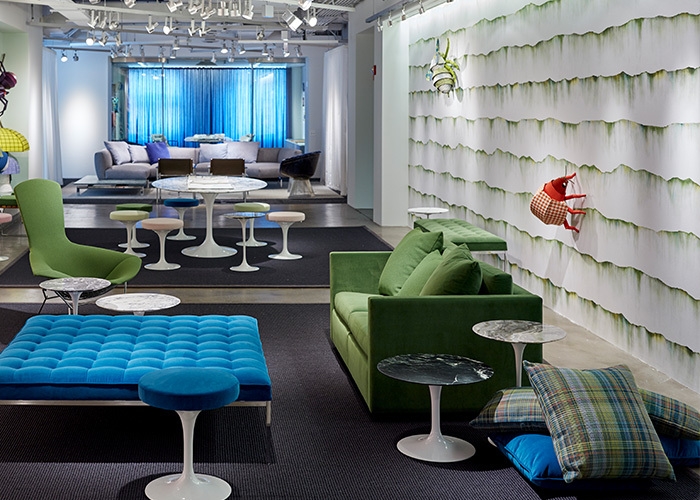 The Knoll showroom featured five themed spaces which illustrate Hospitality at Work: Welcoming Environments, User-Directed Experiences, Flexible Solutions, Material Variety and Residential Aesthetic. Experience the showroom overview here: Knoll NeoCon 2018 Showroom. 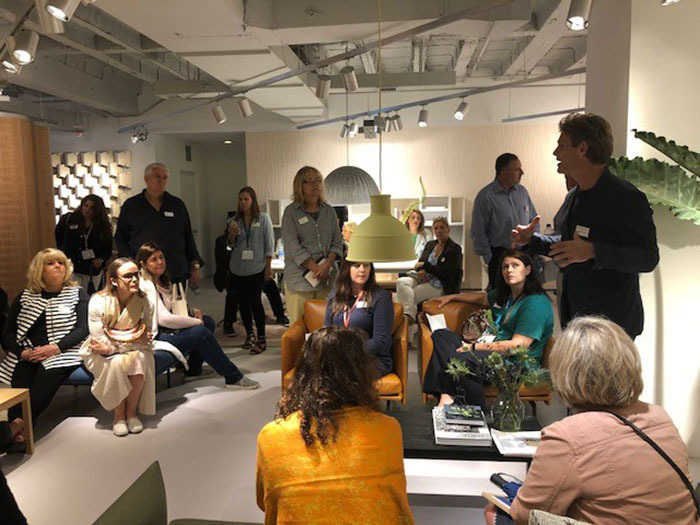 NeoCon 2018 began on Sunday for Knoll Dealers and Knoll associates with an in-depth showroom walk through, stopping at specified zones for product training. Participants toured the five thematic spaces - Welcoming Environments, User-Direct Experiences, Flexible Solutions, Material Variety and Residential Aesthetic - learning how each space approaches hospitality in the workplace. Product training highlights included workplace and education solutions, Ollo by Glen Oliver Loew, k. bench, KnollStudio re-introductions and Muuto furnishings. Allison Scott, Knoll Office Product Marketing Manager, left, presenting Ollo by Glen Oliver Loew and Lily Fine, KnollStudio Product Marketing Manager, right, presenting the Butterfly Chair. 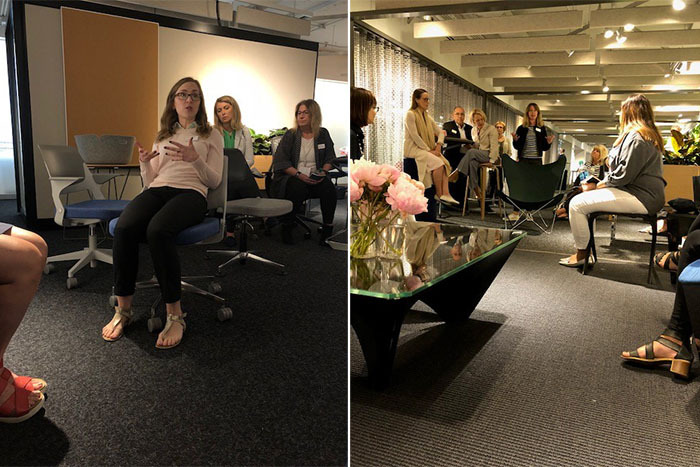 Knoll product marketing managers discussed new products and collection additions, from Ollo to the Newson Aluminum Chair to the Rockwell Unscripted Sawhorse Workbench. Daniel Valewink, Muuto Regional Manager, presenting Muuto seating. On Day One of NeoCon 2018, Knoll offered two design seminars: Rockwell Unscripted®: Where You Complete the Story and Meet Christian Grosen of Muuto. Barry Richards, Principal and Studio Leader, Rockwell Group and Tracy Wymer, Vice President Workplace Strategy, Knoll, discussed how today’s workplace can respond to new and changing needs for collaboration and flexibility, particularly how the ideas behind Rockwell Unscripted accomodate the continuous evolution of the workplace. 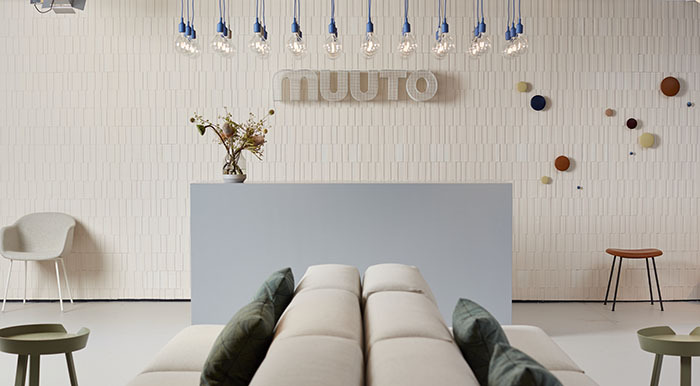 Christian Grosen reviewed new perspectives in Scandinavian design from Muuto. Both seminars are available for replay at knoll.com/live, where you can also stream two addional seminars on Tuesday, June 12. Replay the design seminars here: Knoll NeoCon 2018 Live Events. At the 2018 Best of NeoCon Awards, Knoll benching solutions swept the category. Rockwell Unscripted Sawhorse Workbench, an enhanced iteration of the Rockwell Unscripted Sawhorse Table, won Best of NeoCon Gold. k. bench, the latest addition to the family of height-adjustable benching solutions, won Best of NeoCon Silver. 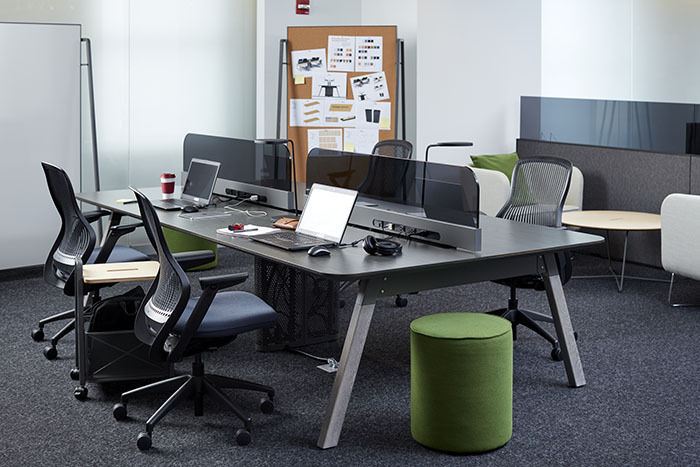 Together, the two additions to the Knoll portfolio of benching solutions prove to solve for connectivity, collaboration and evolution within the workplace. The Atmosphere Collection, designed by Trove for KnollTextiles, won the Best of NeoCon Gold for Wall Treatments. Designs by KnollTextiles also won two Best of NeoCon Awards this year. Designed by KnollTextiles Creative Director Dorothy Cosonas, the Between the Lines Collection won Best of NeoCon Silver for Healthcare Fabrics & Textiles. The Atmosphere Collection, designed by Trove for KnollTextiles, took home Best of NeoCon Gold for Wall Treatments. The Rockwell Unscripted Sawhorse Work Bench, an enhanced iteration of the Rockwell Unscripted Sawhorse Table, won Best of NeoCon Gold for benching solutions. The Between the Lines collection by Dorothy Cosonas won Best of NeoCon Silver for the Healthcare Fabrics & Textiles category. 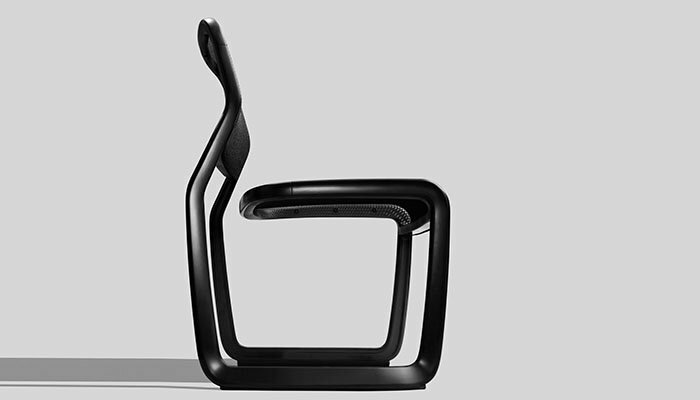 At the Interior Design HiP Awards, Marc Newson's Aluminum Side Chair for Knoll won the award for the Workplace: Guest Seating category. Honoring the cantilevered chairs of Ludwig Mies van der Rohe, the Newson Aluminum Chair, 90 years later, is a forward-looking expression that synthesizes simplicity, material and precision, in the Modernist tradition. 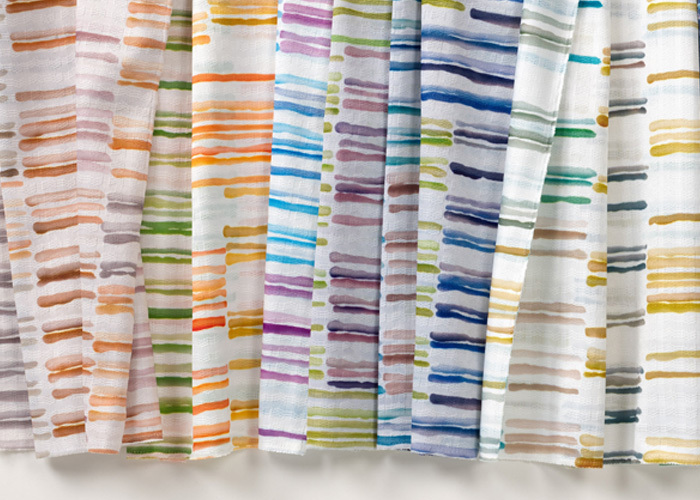 Additionally, the Between the Lines Collection designed by Dorothy Cosonas won the HiP Award for the Health & Wellness: Fabric and Textiles category.